If you sustained an injury from a car accident or a personal injury, you probably saw a physical therapist and his or her physical therapy assistant. The physical therapy assistant plays a vital role in helping a person recover, which may make you want to become one. You should first decide if a physical therapy assistant salary is adequate for you and if the requirements to become one meet your needs and suit your life. 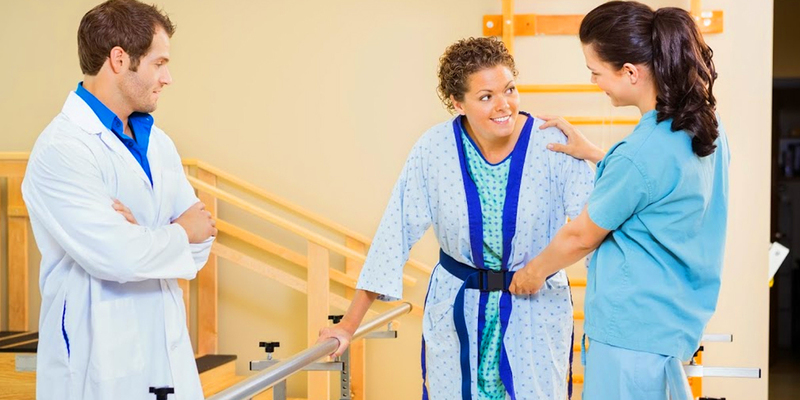 To earn a physical therapy assistant salary, you must assist patients in regaining their mobility, strength, flexion, and function after an injury or illness. As a physical therapy assistant, you work under the direct supervision of a physical therapist, meaning they devise a plan for the patient and you execute it. You may have to guide the patient through exercises, perform diagnostics, or provide treatments like electrotherapy, all with the goal of improving the patient’s mobility in mind. You might need to show patients how to use orthotics, walkers, or wheelchairs to prepare them for using these devices on a regular basis. Additionally, you may need to help the patient adjust to having a prosthetic. In addition to working with the patient, you also have paperwork to complete regarding the patient’s progress and medical history. Some physical therapy assistants have billing and coding-related responsibilities as well. If you become a physical therapy assistant, you must provide patient education, sometimes to their families as well. Since physical therapy assistants work under the supervision of a physical therapist, they tend to work in places where physical therapists are. According to the Bureau of Labor Statistics (BLS), physical therapy assistants held 88,300 positions in 2016, and 45 percent of them worked in the offices of speech, occupational, or physical therapists. On the other hand, 23 percent of them worked in private, local, or state hospitals. Approximately, 11 percent of physical therapy assistants worked in nursing care facilities including skilled facilities. Eight percent worked in home healthcare agencies while only five percent held a position in physicians’ offices. Almost any job you can hold in the medical field, including becoming a physical therapy assistant, requires you to have compassion. You need to have a genuine love for helping people and wanting to improve their lives. Additionally, you must have empathy and understand the struggles of the individuals you’re helping. Much of your job requires keeping accurate records and communicating effectively with patients. You also have to follow both verbal and written instruction well. If you don’t pay attention to detail, you could find yourself administering treatments improperly, possibly reducing their effectiveness or harming your patient. You do have to move people and stand for prolonged periods of time. You also have to kneel, bend, and move in general, so you should like physical activity and be capable of doing it. You must attend college to become a physical therapy assistant. At the minimum, you need to earn your associate's degree in a physical therapy assistant program. The Commission on Accreditation in Physical Therapy Education revealed there were almost 350 associate's degree programs for physical therapy assistants, so it shouldn’t be difficult to find one near you. Generally, your program lasts for approximately two years. During this time, you take courses in anatomy, psychology, and physiology in addition to your general studies. You must also complete a supervised clinical experience. During the course of your program, you might need to earn your cardiopulmonary resuscitation (CPR) certification and become certified in first aid. If you would like to increase your physical therapy assistant salary and enhance your potential for landing job opportunities, you may want to earn a bachelor's degree. This, however, isn't necessary to land most jobs. It takes about an additional two years after you earn your associate's degree to obtain your bachelor's degree. If you want to earn a physical therapy assistant salary in any state in the United States, you must obtain your license or certification. Typically, if you want to acquire this licensure, you must graduate from an accredited school. Then, you must pass the exam administered by the Federation of State Boards of Physical Therapy. In some states, you have to undergo a criminal background check and pass a test specifically about the laws relating to physical therapy assistants. You may need to take continuing education courses to maintain your license. Usually, you complete these courses when you renew your license. The median hourly wage for a physical therapy assistant was $27.70 per hour as of 2017. Therefore, the average physical therapy assistant salary per year is $57,620. You can expect to get paid slightly less as a new graduate with limited experience. The lowest earners had an average salary of $17.27 per hour, which is the same as $35,930 annually. The highest earners had an average annual salary of $79,380. Your physical therapy assistant salary varies based on your location. For instance, if you work in home health care services as a physical therapy assistant, you can expect to make an average yearly salary of $65,640. On average, physical therapy assistants who work in physicians’ offices make an average of $53,220 per year. The medical field and jobs for physical therapy assistants will continue to flourish as long as there are people who need medical assistance. In fact, the Bureau of Labor Statistics (BLS) states the employment opportunities for physical therapy assistants will grow by 28 percent from 2016 until 2026, which is much faster than most jobs. The increase in employment opportunities for physical therapy assists is due to the high amount of baby boomers who are staying active for longer and are susceptible to diseases like arthritis and medical emergencies like strokes. Another reason for the growth is because of how many people suffer from obesity and obesity-related condition that affect their mobility. If you practice as a physical therapy assistant as a new graduate and enjoy the work but would like to have more impact on the health and wellness of patients, you may want to become a physical therapist. You also earn a higher salary this way. This particular job requires you to go to school to earn your doctorate in physical therapy. You can do so by completing a four-year bachelor degree in physical therapy and then going to graduate school. Ultimately, this approach usually means you have to go to school for a total of eight years. You may want to join a program where you earn your bachelor’s degree and then continue on to complete your doctorate in physical therapy, also known as your DPT. Typically, this course of action allows you to graduate in six or seven years. Physical therapy programs usually consist of classes like biomechanics, physiology, anatomy, pharmacology, and neuroscience. You’ll also need to complete 30 weeks of clinical work. After you complete your degree, you must complete a residency that usually lasts about a year. A physical therapy assistant salary is rewarding, and so is the opportunity to help people gain their mobility back. You have a variety of responsibilities and your patients change regularly, making it an exciting career from the time when you’re new graduate until you retire.